Montrose has gotten a bit of love from the Wilson L renovation that is now winding down. You might recall the chain link fence and the remains of the old concrete track structure that greeted pedestrians along Montrose. 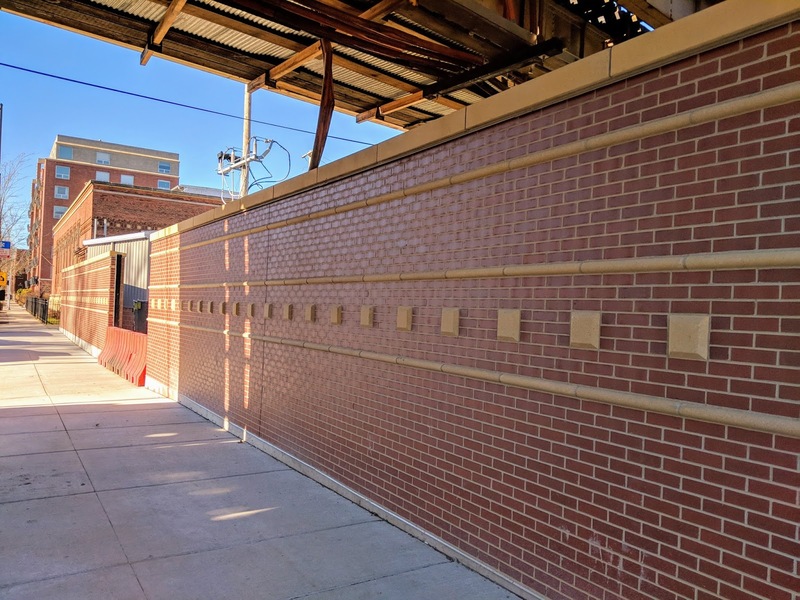 The track remnants were thankfully removed a while back and now a red brick wall with beige accents has been completed to hide the CTA electrical components and workshops. A gate to the area is still not completed. It is a definite improvement over what was there, that's for sure. But will this become a place for persistent tagging to occur? For the love of God, only if we let it! Let's not focus on the positive. Let's immediately think of the negative. This was funny. All too many times the comment section becomes so negative. I get it, life is harsh. But the wall looks good and let's try and work together as a community to keep it that way. I repeat and don't know why this wasn't thought about. There needs to be a long runway from Montrose to the Wilson station so that the montrose bus won't have to detour down Wilson. And can go back to going down Montrose like in the old days. ....Once again, this is all *Speculation* (a guess) on my part. ....But, if the Montrose bus went straight East/West along Montrose, then there'd be no East/West bus service (which would be expected) at the major L stop of Wilson Ave. (itself). ....Also, there's nothing but a big brick wall along the south side of Montrose, from Clark Street almost all the way to Broadway;-- While along Wilson Ave. there are numerous small businesses, and a City_of_Chicago_College_Campus between Clark & Broadway. ....And last, but not least, by not having a one block long elevated walkway from the station platform down to Montrose, you then save on station construction costs, while NOT increasing the walking distances from the station down to Montrose, or to the nearest to Montrose Ave. bus stop made by the Montrose Ave. bus (@ Sunnyside & Broadway). Look, we know you really want to the Montrose bus to stop a few minutes closer to where you live because I can't think of another reason anyone would want this and post so much about it, but you know exactly why it isn't routed that way. This act where you pretend you want this because it's smart and not because it benefits you (at the expense of others) has grown tiresome. And also, who wants to walk a block and half to get an L platform? That's the biggest complaint about the Congress branch stations.